Concerns over the health of two timing transponders inside Europe's Gaia spacecraft have delayed launch of the $1.2 billion mission to map the positions of a billion stars from Nov. 20 until at least late December, officials said Wednesday. 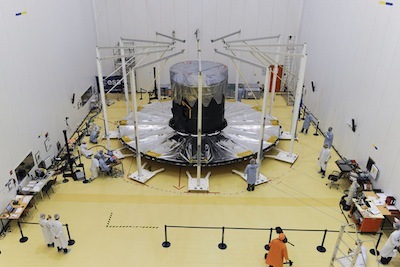 The European Space Agency said it plans to remove the suspect transponders from Gaia, which was about to be fueled for launch at the European-run Guiana Space Center in South America. Engineers will ship the items back to their manufacturer, Thales Alenia Space of Italy, for repairs. The delay means Gaia will miss its current launch window, which opens Nov. 17 and closes Dec. 5. Gaia has another window beginning Dec. 17 and running through Jan. 5. The spacecraft will scan the galaxy from a position at the L2 Lagrange point about a million miles from the night side of Earth, a thermally-stable position where gravity from the Earth and sun balance a satellite's motion. Gaia can only launch at certain times to reach the L2 Lagrange point. Gaia was on track for liftoff from French Guiana on Nov. 20 aboard a Europeanized version of Russia's Soyuz rocket. Officials decided to push back Gaia's launch after a problem with similar transponders on a satellite already in orbit. Thales will replace components inside two of Gaia's transponders responsible for generating "timing signals" for downlinking the mission's science data, according to an ESA statement. 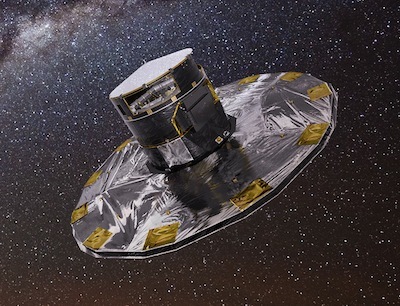 ESA did not identify the spacecraft with the problem that forced Gaia's launch delay, but two European space officials told Spaceflight Now the issue was similar to a glitch found on Thales-built broadband communications satellites launched in June for O3b Networks. A Thales spokesperson did not respond to a request for comment. Details of the problem with the O3b satellites have not been disclosed by O3b Networks or Thales, but O3b officials opted to delay the launch of four more spacecraft in September to absolve the new satellites of the issue. 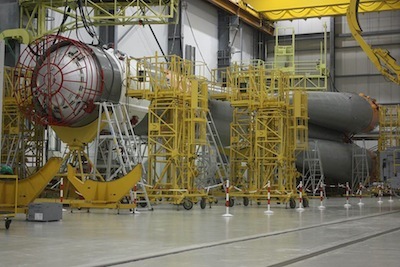 The O3b launch on a Soyuz rocket in September was supposed to occur before Gaia's Soyuz flight, but the O3b delay put the commercial mission behind Gaia on the Soyuz manifest in French Guiana, which is managed by Arianespace. Arianespace plans the launch of an Ariane 5 rocket with the ASTRA 5B and Amazonas 4A communications satellites Dec. 13, and it takes at least two weeks to reconfigure the French Guiana spaceport between Ariane 5 and Soyuz flights. If the Ariane 5 launch stays on schedule, and Gaia's transponder repairs go well, Gaia could launch the last week of December, a Guiana Space Center official said. Arianespace has a busy Soyuz launch schedule to begin 2014, with up to four Soyuz missions slated before the middle of the year. After Gaia, which could take off before the end of 2013, Arianespace plans the O3b launch in early 2014, the launch of Europe's radar-equipped Sentinel 1A Earth observation satellite in the spring, and a mission with the first two fully operational spacecraft for the European Galileo navigation network. The first Ariane 5 launch of 2014 is preliminarily set for Jan. 24 with the ABS 2 broadcasting satellite to cover the Asia-Pacific, Africa and the Middle East and the Athena-Fidus communications craft to serve French and Italian civil and military authorities.